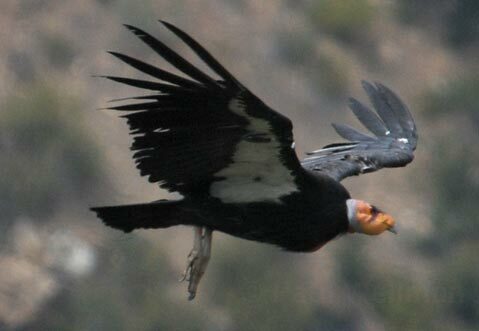 <strong>LOOKING OUT:</strong> The California condor is one of the endangered species with habitat in Los Padres National Forest. Activists said the Forest Service Plan impinged upon roadless areas meant to protect forest ecosystems. Late on Tuesday, September 29, U.S. District Court Judge Marilyn Hall Patel ruled that a management plan adopted in 2005 by the Forest Service for four Southern California forests-including the two-million-acre Los Padres Forest, which sprawls across Ventura, Santa Barbara, San Luis Obispo, and Monterey counties-is in violation of two facets of the National Environmental Policy Act. The State of California and a coalition of environmental groups represented by the law firm Earthjustice filed suit against the Forest Service in 2008, after an exhaustive civil appeals process. The plan, said Earthjustice attorney Erin Tobin, failed to adequately address the environmental impacts of activities currently taking place in the forest including energy development, wildfire management, and, particularly, offroad vehicle use. “Hopefully the effect will be a better plan that does more to protect species and habitat,” she said, explaining that because the state’s appeals were dealt with more quickly, they were able to file suit well before Earthjustice and its clients. The case’s plaintiffs, which included the Center for Biological Diversity, the Sierra Club, Defenders of Wildlife, the California Native Plant Society, the California Wilderness Coalition, The Wilderness Society, and Santa Barbara-based Los Padres ForestWatch, also argued that the Forest Service had failed to provide alternative management of species that may flag environmental conditions in the region, although the court’s ruling did not support that claim. In addition to Los Padres National Forest, the Angeles, Cleveland, and San Bernardino national forests are also affected by the decision. The four forests cover a 3.5 million-acre swath of land running intermittently from Big Sur south to the Mexican border. Jeff Kuyper, executive director of Los Padres ForestWatch, said that it will take at least another 30 days to determine the impacts of the decision. “Really, the big question is, what projects can be approved in the forest without the plan [in place],” he said, adding that there are currently about 600,000 acres of undeveloped, roadless land in Los Padres (out of a total of 974,000 acres in all four forests combined). Earthjustice maintains that in Los Padres, the management plan in effect opened up 443,000 currently roadless acres to road building and other types of development. Kuyper wasn’t aware of any impending development projects, but because the plan recommended that only 35,821 acres in the Santa Barbara and Ventura county portions of the Los Padres National Forest be set aside as wilderness areas, the lawsuit’s backers were concerned about potential road expansion and resource development in the remaining areas. John Heil, a Forest Service public affairs officer, countered that the court found the management plan to be in keeping with the state’s land use policies, but faulted the Forest Service for its failure to include information about coordination efforts between state and federal agencies in the final environmental impact study. As for oil and gas development impacts, he said analysis of that portion of the plan was deferred, as it is currently being challenged in another federal district court.